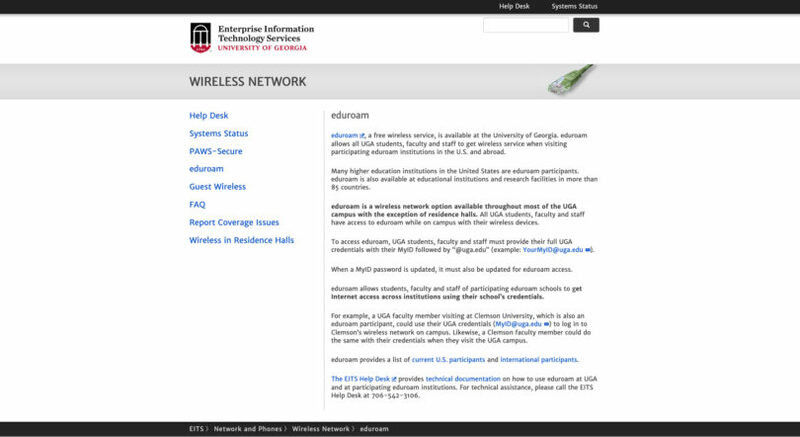 A free wireless service, eduroam allows students, faculty and staff of participating eduroam schools to get internet access across institutions using their school’s credentials. Available at the University of Georgia, eduroam allows all UGA students, faculty and staff to get wireless service when visiting participating eduroam institutions in the U.S. and abroad. Many higher education institutions in the U.S. are eduroam participants. Eduroam is also available at educational institutions and research facilities in more than 85 countries. Eduroam is a wireless network option available throughout most of the UGA campus with the exception of residence halls. All UGA students, faculty and staff have access to eduroam while on campus with their wireless devices.